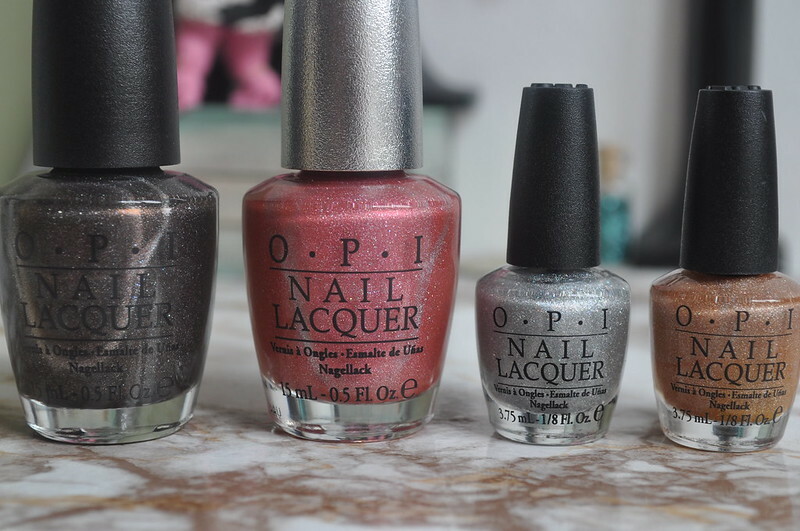 Before I started blogging OPI was my favourite nail polish brand and I didn't own any polishes from other brands. Skip forward 3 years and my love for OPI has sort of been forgotten. I haven't really been a fan of any of the collections they've come out with or been excited about any colours really. Until now that is! I was looking at the Lena White website to see how much the OPI nail polish thinner is for a different blog post I was writing. Before I knew it I'd added polishes to my basket and was entering my card details. I just could not resist free delivery, discounted polishes in the Bank Holiday sale and an extra 20% off. Now these four polishes aren't new releases, one has been on my wishlist for years and the others I've wanted but never really thought about actually buying, but I was so excited when I opened the parcel. They look even more amazing swatched than they do in the bottle if that's even possible. The two minis and the pink polish are from the designer series and each full size bottle costs £16. The only polish from OPI I would ever pay £16 for is DS Extravagance. With all the discounts I manged to get Reserve for £13.40 which is still expensive but much better than £16. The two mini DS's were £3.20 each and My Private Jet was £8.80. Pretty good savings if you ask me! Did you order anything from the OPI sale?